My goal today is to offer inspiration. This isn’t for all of you. 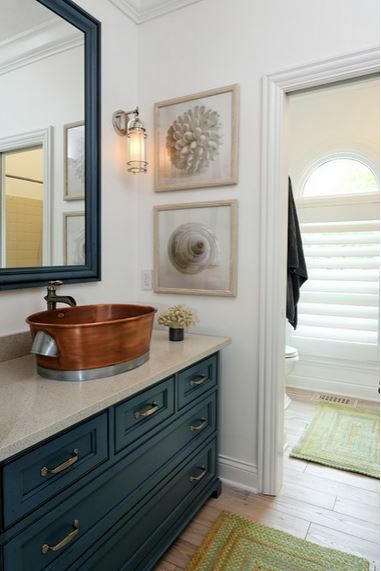 I know there are those of you who simply thrive in neutral homes, and long for cabinetry in your home that is painted white, or another neutral color, or that is stained wood. If that’s what you like, and that’s what your personality calls for, then that’s definitely what you should have. I think there are a lot of people out there like this. I look around at the unbelievably overwhelming number of white and neutral kitchens and bathrooms out there, and I just think to myself, “Surely not everyone can like all of this neutral stuff! !” I just know in my heart that there are plenty of people living with these neutral kitchens and bathrooms, not because they love neutrals, but because they’re afraid to embrace color. I’m definitely not one of those people. 🙂 I’ve tried the whole neutral thing, and it just doesn’t resonate with me. I love to see a beautifully decorated neutral room in other people’s homes, but I can’t live with it in my own home. Obviously. Color just speaks to me. It nurtures my creativity. It actually relaxes me, where neutral rooms make me feel anxious. 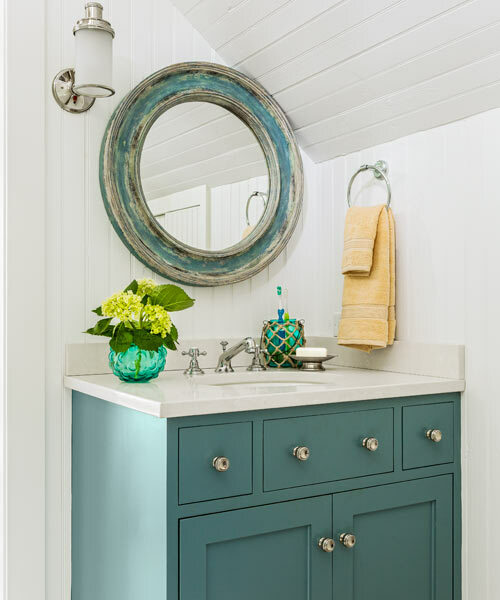 If you share my love of color, but you’ve been afraid to take the plunge on something as large and dominant as kitchen cabinets, then take a smaller step and paint your bathroom vanity. 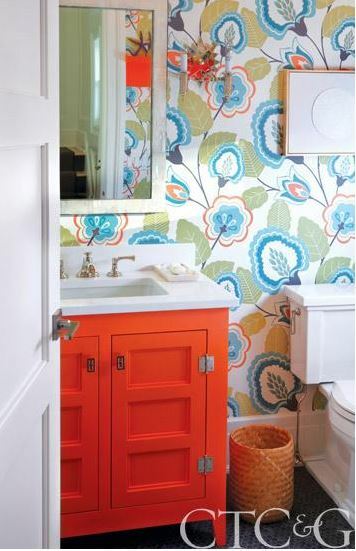 It’s a good place to start, and a safe place to begin introducing more color into your home. And if you’re wanting to embrace color, but still be on the “safe” side, a shade of blue or green is beautiful while still being safe. 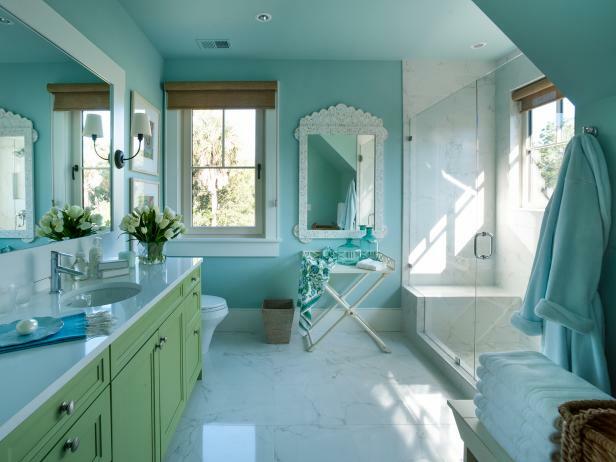 Blues just make sense in a bathroom, and greens are nature’s neutral, so most people find greens very comforting. And you could always meet in the middle and use an aqua, or turquoise, or teal, or another blue/green combo. But of course, if you’re really ready to take the plunge, and you want to head straight for the deep end of the pool (no wading in the safe kiddie pool is necessary for you), then go bold! 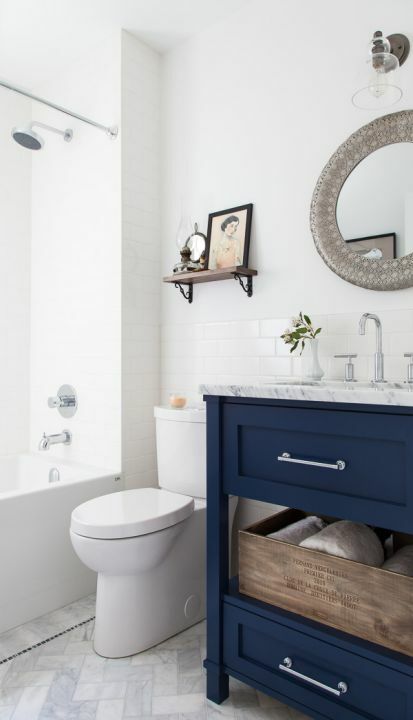 Most people find warm colors — reds, oranges, yellows — to be a little (or a lot) less “safe”, but they sure can have a dramatic impact on a bathroom! Thanks for the inspiration! I have a bathroom that is 35years old and desperately needs a facelift. But a remodel isn’t in the cards now. I’ve been wanting to paint and maybe go for a new countertop, but have been stuck as we’ve got an almond shower surround and toilet. The pics you linked to gave me some inspiration on how to decorate with the almond but still incorporate some color and fun. Twenty years ago I painted all of our cabinets white and painted the island “School House Red”. Loved it. I will paint a room/wall/cabinet/door in a heart beat. My husband goes out side to smoke and during one of his smoke breaks I painted the wall a burgundy. Hey just came in sat down and said, “Has that wall always been that color?” and then winked. It just pops into my head that something needs to be painted a particular color and I just do it. It may not stay that color for long but for the moment it is always perfect. And, as for my guy…. He just rolls with it. I’ve always had a lot of colour in my home. No fear here. For instance – in my current place the kitchen cabinetry started out as deep red on the lower ones and cream on the uppers. My walls were a soft butter yellow. That deep red moved to the upper ones a few years ago and the island went black. Then I got a new counter depth fridge (second hand – a removal from a commercial kitchen). It got a coat of red too. About a year and a half ago the red fridge got changed to black and I put huge vintage style cutlery decals on the doors. Now I’m about to paint all my cabinetry black and the walls are going creamy white – so even though I’m getting rid of a lot of the predominant colours I’m still going to have a great deal of contrast. The colours will be in my accessories. And who knows – the island might get a coat of something completely different. Like a bright red or chartreuse? 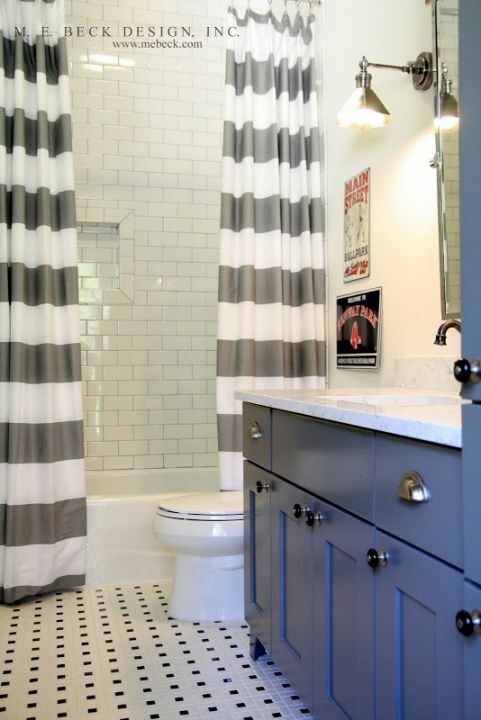 I had a bathroom in my old house that I painted 3 shades of blue. 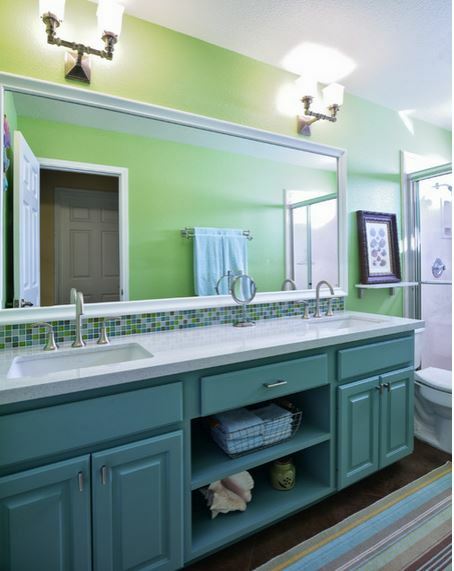 It was my childrens bathroom and we painted walls, ceiling and cabinets 3 different shades and hung glass fish from the ceiling. My bathroom was purple and peacock blue. My boring husband whose favorite paint color is taupe had an offwhite and tan bathroom. Boring! We are renting the house out now while we are out of the country but we’ll be back in it before year end. I can’t wait to get my hands on the kitchen! 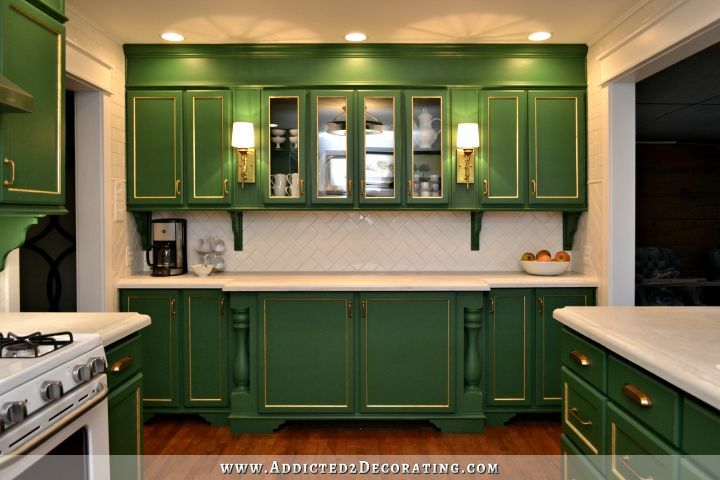 Thanks for the great inspiration pix and another share of your gorgeous green kitchen…..my favorite by far. I hope you smile every time you enter it. Great inspirational pics. I just loooovvveee the red vanity. We are doing a master bath remodel in our future so I’m keeping that one filed. Yeah! I’m on track. We are at present doing the new master bathroom. 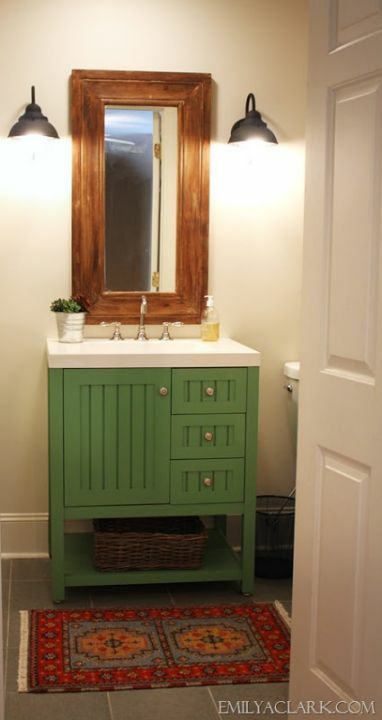 I bought an old curvy drawer desk, now bathroom vanity, a bold teal green. I becoming more bold and yes, breaking out of my neutral palette! Can’t wait to see your finished bathroom. I loooooove color!! I have green walls in my living room, blues in the bedroom, yellow in the entry/ hall and am looking for a perfect orange-ish color for my kitchen/dining area. I have a lot of boring old wood tones on all the cabinetry in my home and your blog has inspired me to try out some new trim and paint colors to freshen them up! I think one of my most favorite things about your blog, next to your ability to do anything, is your love of color. 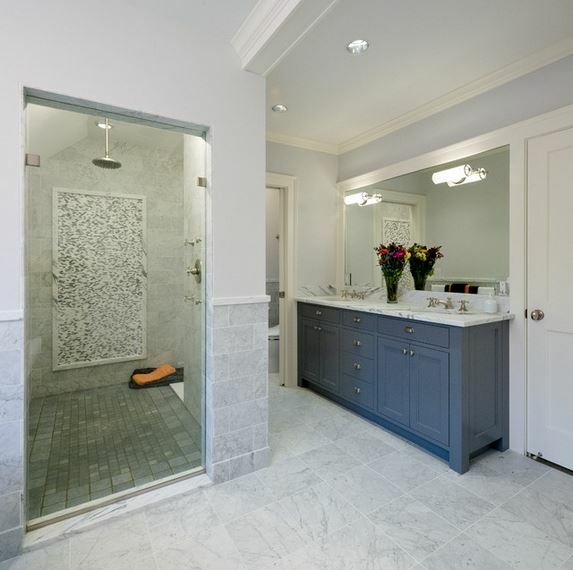 I have a brand new bathroom that I would like to put the ceiling to floor shower curtain in but there is a horizontal window above the shower stall for natural light. If i do this style of curtain should I worry about the window or just go for it? I would go for it, but leave the shower curtain open when not in use, kind of like a drapery panel that frames a window. That way you won’t block out the light from the window. I started following your blog because you were not afraid of color. Many bloggers paint cabinets white, and it almost always looks better than it did before. I feel like you have a great sense of color and I respect the fact that you do things and take risks that other people do not. Our styles are actually very different, but somehow I am always drawn to your work. I think your sense of color appeals to me so much because I am a graphic designer. That being said, I would love, love, love to paint my island blue! But as someone who has owned four houses in 14 years I know that there is nothing realtors hate more than a non-neutral house. An accent wall once put my realtor into such a tizzy she called me everyday to ask me to paint it. I’ve gotten away with non neutral walls, going against realtor advice with every sale, and actually my houses have sold faster than what the market trends dictated. But still, I am not brave enough to paint cabinets. 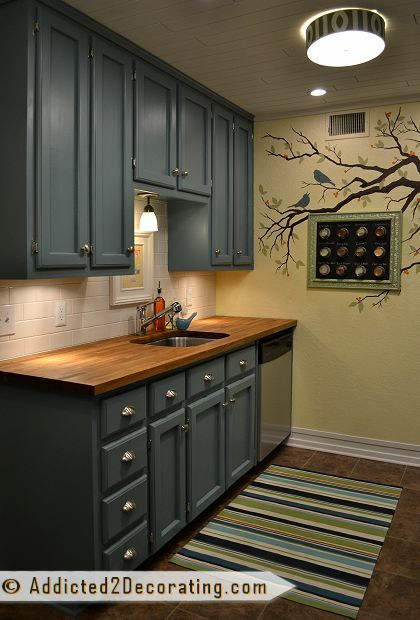 People who buy a resale may be willing to repaint walls, but they are not happy with the idea of repainting cabinets. It requires more prep, more coats of paint, and more topcoats. Someday I would like to know this is my forever house, and then I am going to go crazy painting cabinets to make up for having to hold back all these years. 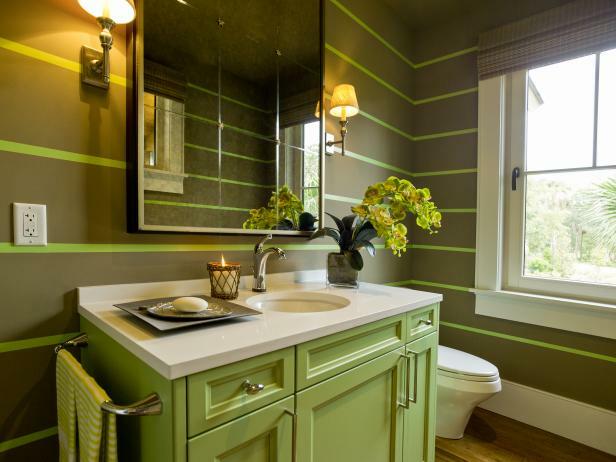 Until then I guess I will just have to live vicariously through your blog and have painted vanity envy. I am also one that has to have colour and thankfully the husband feels the same way. I recently painted our 67 year old stained wood kitchen cabinets antique white which I know is safe. But for an old house, I have a lot of cupboards and they are in pretty rough condition thanks to years of abuse from previous owners. 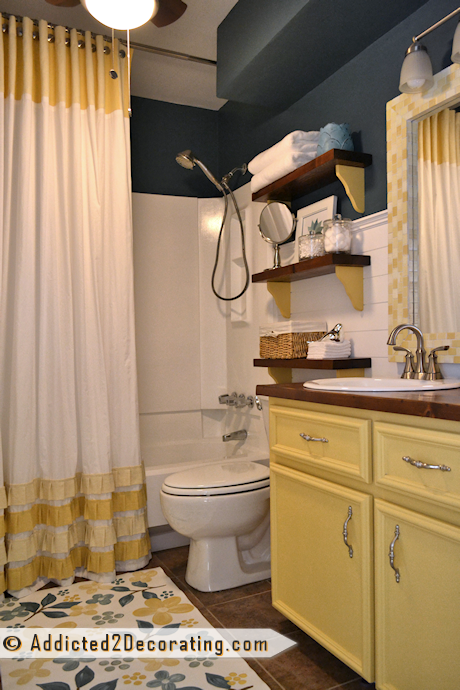 My goal was to make them look clean and not compete with the bright, cheery yellow I painted the walls. Great inspirations pics! 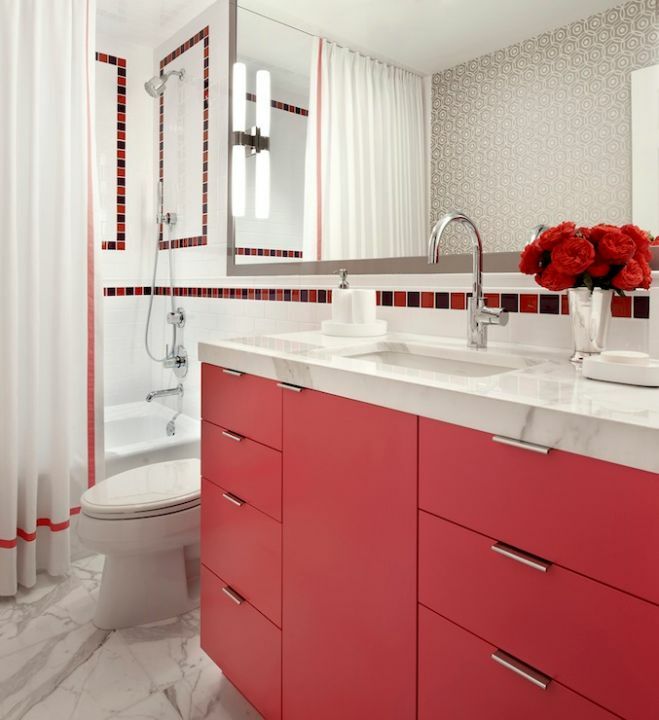 The one with the red vanity and black, white and red tiles would be perfect for our main bath. I’m gonna have to pin that one. Most realtors would say yes. I say no. 🙂 As long as it looks pretty, well though out, and put together, I don’t think that a house needs to be all neutral to sell. When we sold our last house the only room that wasn’t color was our laundry room. I asked the Realtor to take a poll with people seeing our house as to all the colors and finishes. We only had one negative response and it was from an elderly man who grew up with white walls and that was that. It sold in 3 weeks. Neutral walls kill me. The only thing worse than a white wall, is a beige one! Probably why I am addicted to addicted2decorating.com. I’m thinking of painting the vanities in our home because the previous owner did a terrible (although I’m sure they loved it) white wash finish that I hate. I was thinking about doing a navy blue but I’m not sure which type of paint to use. I have 3 kids ranging in ages from 3 to 15 and they beat the heck out of everything. I’ve watched several videos on youtube on the proper way to paint cabinets and short of buying the Rustoleum kits, do you have tips for painting cabinets and vanities so I don’t have to worry about it peeling and chipping off? I love color. 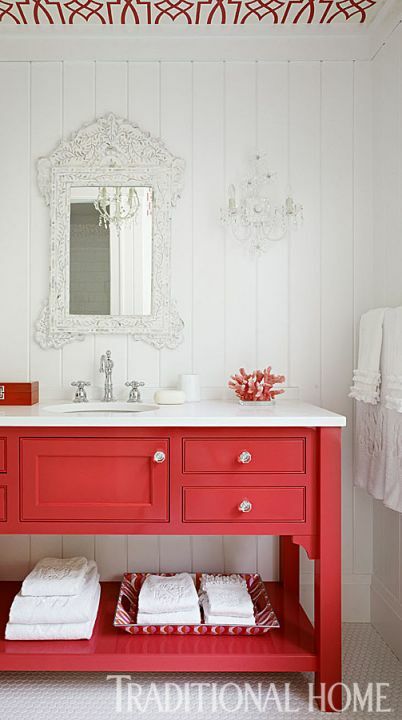 A red vanity in your new bathroom would be fabulous! I have color in our home and it truly does speak to me. At this time I am trying to figure out what color to use in our kitchen. The family room is Warm Cider and the living room is light yellow with red furniture. Suggestions? I couldn’t agree with you more! I love color. We are remodeling our house now and are doing most rooms in differing shades of blues and greens, including aquas, etc.. Those are my favorite colors and they calm me. I don’t understand the current trend of everything in a home being white. I keep seeing kitchens with white cabinets, white back splashes and very light counter tops. Not only do they look washed out but they literally hurt my eyes to look at them. I just don’t know how anyone can live with all that white. It is just too sterile to me. It’s so funny to me that realtors say that neutral homes are better. If I walk into a home that is painted white or beige, all I can think of is how much work I’m going to have to do to add color by painting everything, lol! So many people decorate their homes based on only the resell issue instead of decorating according to what makes them happy. I love your decorating style and can’t wait to see what you do next since I know it will be beautiful! I’m currently working on my master bedroom. 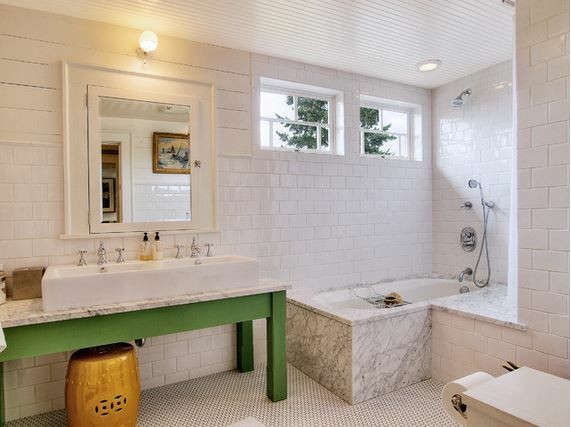 Our only bathroom is connected to this bedroom (150YO house) so I feel like the two rooms need to coordinate and also coordinate with the living room because the bedroom is right off the living room. Due to guests needing to access the bathroom, the bedroom door is always left open. Since I love color and I love white or off white walls I need big pops of color in my rooms to keep some warmth in each room. I don’t like the cold feeling of totally colorless rooms. We haven’t begun the bathroom reno yet but in thinking about colors I purchased a beautiful floral shower curtain thinking I could pull color from it to use in all three rooms. But now that I’ve hung it to get a feel for it I find it’s too busy. I painted the bedroom White Dove (BM) with plain bright white trim and I love the subtle effect! I plan to use the same in the bathroom. Your post today has inspired me. I think I will paint my vanity in a nice color (undecided which one) and then repeat that on the framed antique tin ceiling tiles that serve as my headboard in my bedroom. I’m now going to go get out the fabrics I’ve chosen to reupholster my living room furniture with and choose a color from those to use in the bath and bedroom. I love you and your blog, Kristi, you have no idea how many times your thought process has led me to the answers I need. Some of them have been floating in my head literally for years without coming to a conclusion. I’ve got to get the new bedroom flooring installed pronto now that I have a solution, which has been holding me back!! Bless you, girl! 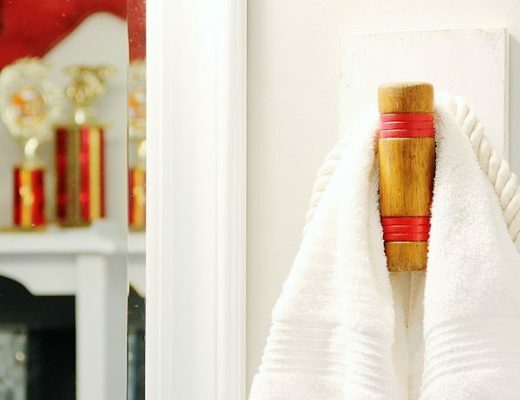 15 years ago when we remodeled our bathroom, I bought an old dresser, turned it into a vanity, and painted it bright red! My contractor thought I was nuts (this was before it was common to make vanities out of furniture), but when it was all done, he admitted it was pretty awesome. Even though my tastes have changed and I’ve toned down my color palette (more dark, rich colors instead of bright, bold colors), the vanity remains and I still love it. Kristi, you haven’t mentioned the condo in a while. Did you sell it? Decide to keep it? It is so beautiful, I’d like to know what your listing agent thinks about all the color. 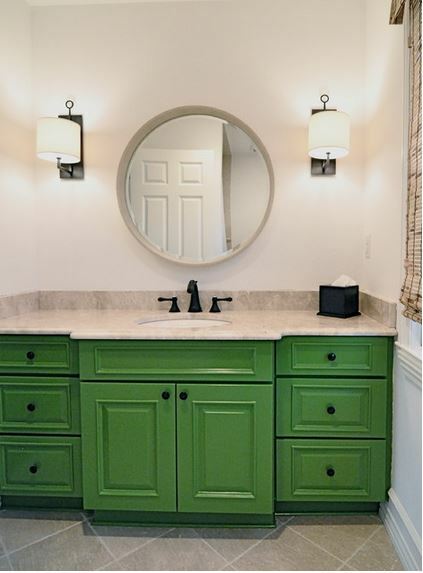 You have definitely inspired me, both in bathroom vanity makeovers and in color choices. 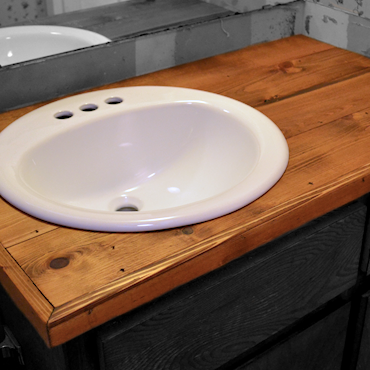 I did 2 bathroom vanity makeovers after reading about your condo bathroom makeovers. On the 2nd one, I embraced color and did it in blue with a walnut glaze, and I love it! 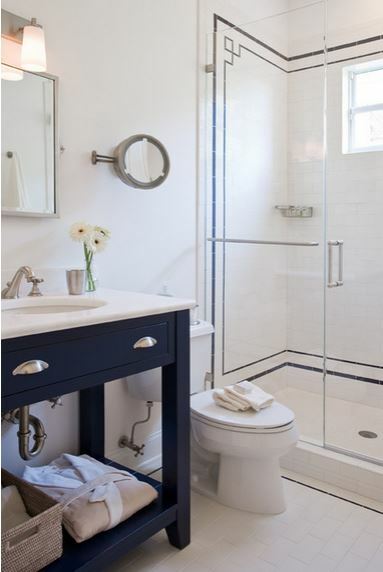 The bathroom walls and floors are neutral, and that blue vanity really adds a pop of color! Kristi, this is such an inspiring post! I have to admit that I love color in the home…I love your kitchen, but I have to admit that I’ve been a little hesitant to bring color into my home, especially in my furnishings. I’m getting there slowly but surely but its a process. Great post! Thanks for posting these inspiring pics. I just completed remodeling 3 full bathrooms. Yes. Three! In two of them I decided to finish off the subway tiled walls with floor to ceiling shower curtains. Everyone who’s seen them have said how different they look, and from their faces, I can tell they don’t love them, but I do so I was so happy to see two of your inspiration pics with the same style. Mine were normal length shower curtains that I added 20+ inches of material and trim to and then I bought three fabric liners and cut them to make two nice liners to work with the new curtains. It was a pain but I love the end result. Love your style and blog, Kristi. Keep shining!!! LOL! Kristi, I LOVE this post! I painted not only my vanity but the walls of my bathroom lipstick red over 15 years ago, and I still love it! My fixtures are white with gold hardware, and it’s just so warm and cozy. I have rich walnut wood accents and a leopard print shower curtain. Just goes to show you that great minds think alike! Go for it, it’s YOUR house! I read the first few line about inspiration and then went to the pictures. I don’t hay reading glasses so can take the stime to struggle through the oratory. I will go back when I find my glass. 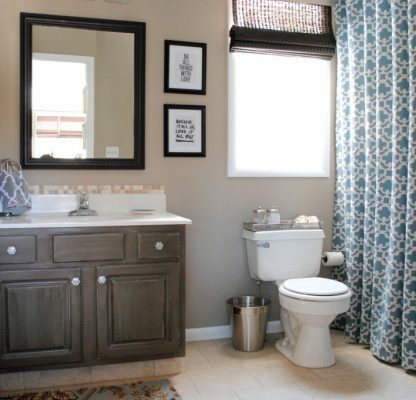 If I were buying a house all of the bathrooms would be acceptable right up to the red vanity with the papered ceiling. That would have to have a few changes. From their own down I would have looked in the door and said, forget it, except for your condo bath, I think that is cute. The others have too much color for my taste. I enjoy a relaxing bath and I could never relax in such chaotic colors. Sorry, just my taste, Keep in my mind, my master bath is needlepoint navy, but every thing else, tile fixtures marble countertops are white. Even the rugs are towels are wihte. I do have some blue and white pottery accents on the vanities and tub deck.Blessings.